Is clutter exhausting you? This January series will address different DIY ideas to clean and declutter each room of your home. Happy New Year! Want to guess what my New Years resolution is? ORGANIZING my home. That means organizing, decluttering, cleaning and rethinking how I want my home to look. I wrote this post back in 2017, but this year I’m ready to tackle it AGAIN after a big move! We moved from a home on a 10,000 sq ft. property to a home with 8.5 acres… but we lost about 800 sq ft in home size. We LOVE our new home, but it’s more important than ever for us to tackle home organization this year. We’ve got tips and tricks from the experts. By the end of the year, most of our closets are a wreck. New purchases are stacked atop old clothes, pieces that we’ve outgrown in size and taste, trendy items that aren’t so trendy anymore — the list goes on. It’s time to get organized. It’ll make deciding what to wear easier because you know that everything is something you like and that it fits. It will also allow you to take inventory of what you already own for smarter shopping decisions in the new year. We spoke to four professional organizers to get their advice for a fresh start for you and your closet. 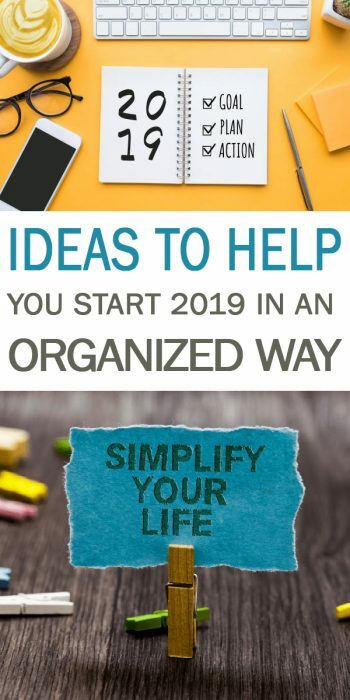 Your best organizational ideas for 2019 are right here at 101 Days of Organization. If you’re ready to make organization a 2019 priority, these ideas will help you start 2019 in an organized way. Keep reading to how easy it is to start the New Year off right!